1:What is the FP wheel? 1: I cannot make the teacup yet though I passed to the ceramic art classroom for three years. 2: I want to present the saucer. However, it is not possible to make it yet. 3: The same one cannot be done. Even if the tidy one can be done, it is not possible to present it because it is regrettable. The one not tidy cannot be presented because it is shameful. 4: Is the potter's wheel necessary to make the work? The training of the potter's wheel of three years cannot be endured. They are big problems that the current ceramic art has. About 90 percent of the pottery used in daily life is shape of the potter's wheel. The potter's wheel throwing is the most excellent method for forming a clay. The distortion of the work of the potter's wheel is a little. A good workman can make it a lot. However, there is a fault, too. It takes years to train. An average potter's wheel workman studies the potter's wheel of three years or more. At this time, the throwing durations of the accumulation are about 6,336 hours. Total production bowl of three years is about 158,400 pieces as a day 200 pieces. It is possible to load into about 66 small vans, and about 30 tons in finished total weight. Shape doesn't become complete though he can make the jar and bowl. He throwing thick and cuts down a lot. In becoming a senior potter's wheel workman, the study of ten years or more isrequired. The accumulation throwing durations are about 21,120 hours. Total production bowl of ten years is about 528,000 pieces as a day 200 pieces. It is possible to load into about 220 small vans, and about 105 tons in finished total weight. The experience of 30 years or more is necessary to be called master of the potter's wheel. The accumulation throwing durations are about 63,360 hours. Total production bowl of 30 years is about 1 million 584 thousand pieces as a day 200 pieces. The work can be loaded into about 660 small vans, and the finished total weight is about 316 tons. The skill comes for the first ten bowl suddenly made to become complete completely. One person who is called "That person is good" from 100 master of potter's wheel is "Meijin". The skill? The paper pattern is passed, and the first ten pieces suddenly thrown become complete completely.The Meijin is not born any longer unlike the age when in the Japanese whole country with thousands master of potter's wheel. Anyway, if you throwing the potter's wheel for ten years, you will be able to become a potter's wheel workman. They are 880 boxes in one year. 40 boxes are loaded into the van. Is it a potter's wheel workman that you hopes? Or, is it a ceramic artist? The person who cannot spend three years on the training of the potter's wheel and the person who starts the ceramic art after 30 years old is passed should at least do the ceramic art in the environment like Rosanjin. What is the environment like Rosanjin? Method of completing work for which creator hopes by handling potter's wheel workman like creator's hands and feet. A lot of famous ceramic artists to have started the ceramic art after 30 years old had been passed have created the work by the method. he is a son in a big dye shop. He is open kiln at the age of 37, employed the potter's wheel workman, and he asked the painter with the picture. He is born in pottery, and opens his kiln at the age of 29. He was good at the picture and the decoration. A lot of potter's wheel workmen had been employed. He was a calligrapher, and a gourmet. He is open kiln by 43 years old. He employed a lot of workmen including Toyozo Arakawa, and he pictured and sculptured the design of the work. He is the first living national treasure in Japan. The origin is coming from of the sculpture department. He opened the kiln at the age of 32. The potter's wheel was left to the workman, and he did a sculpture and a special decoration such as putting up the picture. There is many famous potteries in Japan. However, all except Raku have employed a lot of potter's wheel workmen. Because pottery is the one making it from the division of labor. The potter's wheel workman has not become pottery or a ceramic artist. All in a famous ceramic artist and pottery make the work by the method of Rosanjin. It is good news in such you. If it is FP wheel, the work as designing it is made. The FP wheel changes the concept of the current ceramic art, and is a technique of a quite new ceramic art. The work for which you hope can be made if there is a cross section. There is a merit of making the cross section a work as it is. Anyone understands. The adjustment of the thickness is also very easy. 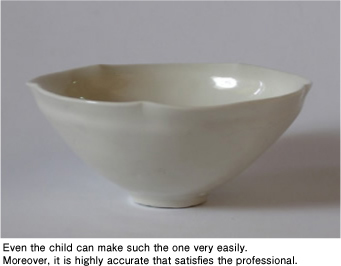 There is various methods of techniques of the ceramic art. method of not being up to now. In FP Wheel, throwing tool moves along a center axis. The lid and the lid receiving part, etc. can be matched and to be suitable without the cutting down process of the one, be made. The lid receiving part can be easily installed in the upper part of a handmade work. The same size lid can be produced if there is a blueprint. pattern is made if it is FP wheel. The work that the skill workman of the potter's wheel of 30 years made can be made for everyone. Moreover, there is high accuracy only of enduring the use of the professional enough.